Regardless of the season, dry lips can be an aggravation. There are many treatments, both over-the-counter and natural, for soothing dry lips. Knowing what to use will ease discomfort and speed healing. There are numerous reasons for dry lips. Some are easily fixed by applying a lip balm while others will need treatment by a physician. Dry lips can be treated with purchased lip balms or natural moisturizers you may already have in your kitchen. Dry weather lacks the humidity that helps hydrate skin outdoors. This can also be a factor in a home that does not have a humidifier during cold weather. Dry weather can cause lips to peel and crack. To replenish moisture to lips, apply coconut oil or olive oil as you would a lip balm, using your finger to apply. Both are all natural and absorb quickly into the skin. Use the oil frequently throughout the day and at bedtime. You may see improvement in a day or two, but you will feel relief almost instantly. Like the rest of your skin, lips get sunburned and wind burned when not protected. Lips that have been sunburned or wind burned will be red, and can sting or be painful depending on the severity of the burn. Use a lip balm with a sunscreen to prevent the burn. If it's too late for that, finding relief could take a few days, just as with any other skin that gets sunburned. Treatment with either straight aloe vera gel or a lip balm containing aloe vera gel will work best when applied several times a day. Overexposure to extreme heat or cold can dehydrate your skin in a more extreme way than being in a dry environment. The appearance of overexposed lips varies depending on how long they were exposed. They can be red and rough feeling or cracked and possibly bleeding. Treating lips that are dry from overexposure can take up to a week or more, depending on the severity of the dryness. Finding and frequently applying a medicated lip balm that has cocoa butter or shea butter will bring relief more quickly. When the body is not getting enough water, dehydration can first present with dry lips and lead to more serious symptoms. Any virus or illness that has the potential to cause upper respiratory congestion or vomiting can cause dry lips due to mouth breathing and dehydration. Dehydration can cause lips to appear red and rough or cause them to peel and crack. This is one reason that doctors tell you to push fluids when you are sick. Treating dehydrated lips is fairly simple. Drink lots of water and use a good lip moisturizer. Coconut oil works within a couple of days for dehydrated lips when used three to four times a day. Lip biting or licking can be due to stress or nervousness, or just a bad habit. This causes the saliva to evaporate from the lips which in turn causes the lips to dehydrate. Lips can then peel which in turn causes more biting. Constantly licking your lips can cause them to become red and painful, and they can crack and possibly bleed. Your best treatment for this is to not bite your lips. However, using a good lip moisturizer and a protectant, such as organic beeswax, frequently and after meals will help prevent the dryness caused by the saliva. It could take three or four days to see improvement of the dryness. Whether you suffer from nasal allergies or sleep apnea, mouth breathing during the night can dry your lips because air constantly passes over them. Mouth breathing can cause lips to be rough and possibly peel on one or both sides of the mouth, depending on how you sleep. A lip balm with beeswax or cocoa butter is your best defense against dry lips due to mouth breathing. Apply a liberal coat at bedtime every night and again every morning. Treatment could take a couple of days for complete relief. Foods high in citric acid, such as citrus fruits and tomatoes, can irritate lips and cause them to dry out. This is also true with candy, gum, or toothpaste that contain cinnamates, a derivative of cinnamon oil. The acid and cinnamates can cause symptoms similar to an allergic reaction. Lips become red and small blisters may even appear. While your best treatment for this would be to limit your use or consumption, a lip balm containing aloe vera will help with the irritation caused by the acids. Use the lip balm or straight aloe vera gel several times a day to keep a coating on the lips for protection as well as moisture. It may take up to a week to have complete relief. If this happens frequently when eating anything containing citric acid, talk to your doctor. You may have an allergy to citric acid though this is a rare condition. You may notice only a single dry or scaly patch. There are a number of reasons that a single dry patch might appear, from lip biting to an allergy and possibly even a vitamin deficiency. 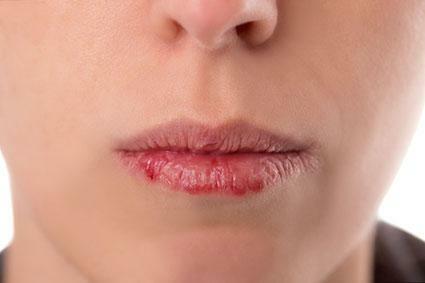 Treat the patch, and lips, with Aquaphor lip treatment every couple of hours for a few days. It may take up to a week to see improvement. Steer clear of products containing petroleum products and lanolin as well as fragrance or dyes. These are allergy triggers for some people. 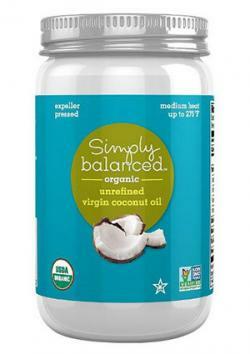 Coconut oil - While any form of coconut oil will work, unrefined virgin coconut oil tastes better. This is a solid oil that melts at the touch of your hand and absorbs quickly. It can be found at most grocery stores for less than $10 a jar. Olive oil - Olive oil works in the same way as coconut oil. While any form will work, extra virgin olive oil has a fruitier flavor and has the benefits of antioxidants. Olive oil can be found at any grocery store for varying prices. Aloe vera - Whether it is a broken piece of an aloe plant or gel from a bottle, straight aloe vera gel is a soothing and speedy treatment for any type of burn, even dry lips. Aloe is an ingredient in many over-the-counter lip balms and treatments. Burt's Bees Beeswax Lip Balm - A natural lip balm made from beeswax, coconut oil, sunflower oil and a refreshing hint of peppermint oil. Burt's Bees products can be found at drug, department, and grocery stores for about $3. ChapStick 8 Hour Moisture with SPF 12 - A moisturizing lip protectant containing aloe and vitamin E, Chapstick can be found at most drug and grocery stores for under $2 per tube. Nivea Lip Butter - This product contains soothing and moisturizing ingredients like cocoa butter, almond oil, and shea butter. Nivea Lip Butter can be found at most drug and department stores for about $3. If your dry lips do not clear up with treatment at home or if they get worse, you should consult your doctor to make sure it is not an allergy to something you are eating or using. If your lips start to hurt or look like they may be getting infected, seek medical attention. If you question the possible cause for the dryness or if it doesn't respond to at home treatment, have it checked by your doctor. This includes both general dryness and single dry or scaly patches. The patch could be nothing more than a dry patch caused from an allergy to a food or toothpaste, but it might also be the start of skin cancer, especially if you are in the sun a great deal without sunscreen on your lips. A daily routine for preventing dry lips is simple: apply lip balm with a sunscreen before going outside and drink plenty of water. Preventing dry lips is achieved by keeping your lips moisturized all day and night. For sanitary reasons, change out your lip balms every two or three months.